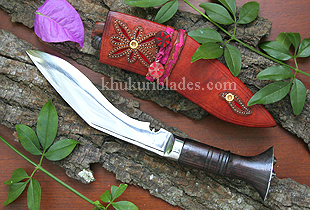 The very famous Kukri “Ganjawal” known for its colorful leather case and its four extra tools in the back its scabbard, now comes in a very small size. The very famous Kukri “Ganjawal” known for its colorful leather case and its four extra tools in the back its scabbard, now comes in a very small size. The blade measures 5 inch as the Biltong. However, due to its small size, the four extra tools are missing because of less spaces, but it does have the sharpner and the tiny extra knife. The new color leather, redder rather than black. A new different look. A black leather case can also be made. Mention it when ordering.